Inner Mongolia is China's third largest region by area. It forms an arid buffer zone between the rest of China and Mongolia and Russia to the north. The Gobi desert is at its heart; to the East it is bounded by the Heilongjiang (Amur) River and to the south by the Great Wall. Population is concentrated near the loop of the Yellow River and along the border with the provinces to the south. It is one of China's Autonomous Regions (A.R.) rather than a province to reflect the large numbers of ethnic peoples. 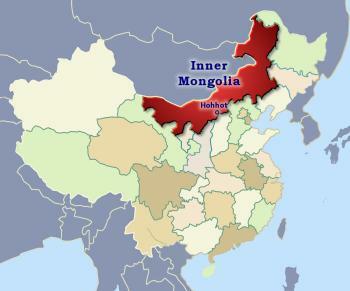 Inner Mongolia is also known as Nei Mongol or Nei Monggu (Nei meaning near or inner) to differentiate it from Outer Mongolia which is now the separate nation of Mongolia. Parts of the province, particularly the Ordos ➚ region contained in the bend of the Yellow River have been settled by Chinese people from earliest times. Mongol people form the dominant ethnic group and they follow the Lamaist Buddhist religion. The Mongolian language is widely spoken and it is frequently seen written on signage for roads and shops. Hohhot or in Mandarin Chinese 呼和浩特 Hūhéhàotè (aso Huhehot) is the capital of Inner Mongolia; it is a city 400 years old with many Buddhist temples. Hohhot is the Mongolian name and means ‘gray city’ from the color of the stone city wall. Sights to see include the Inner Mongolia museum ➚; Xilitu Zhao ➚ temple; Drum Tower;Wutasi ➚ (five pagodas); Dazhao Temple ➚; Wang Zhaojun ➚ tomb and the Emuqi Zhao Great Mosque (reflecting the large Hui/Muslim population). Baotou the largest city, is close by the Yellow River and has industry based around coal and steel. Inner Mongolia has extensive coal deposits, second only to Shanxi province. Wudangzhao (Willow) Monastery ➚ near Baotou is a famous Tibetan Buddhist Monastery. Xanadu (Shandu) the palace of Kublai Khan ➚ made famous by Samuel Taylor Coleridge ➚'s poem is located 199 miles [320 kms] north of Beijing and is just a pile of crumbled mud walls in the desert. The Mausoleum of Genghis Khan ➚ can be seen at Dongsheng (although this is a shrine rather than his burial place which has never been discovered). Wulantuge and Gegentala ➚ grasslands are places where Mongolian nomadic people living in traditional yurts can still be seen. The yurt is a portable tent made of thick felt which can accommodate a family although larger ones can hold one hundred people. Ulanhot in the northern part has the Moli Miao Buddhist Temple; Jialan Shan Monastery is split in two parts by mountains. Manzhouli is on a railway into Russia and has some Russian style buildings. Parts of the Great Wall were built about 1000BCE to keep the marauding people of the Mongolian plain out of settled Han Chinese settled country to the south. Emperor Qin Shihuangdi linked these parts together to form the Great Wall. The Xiongnu tribe were the main threat in these early days. After the fall of the Tang dynasty the Liao and Jin kingdoms/dynasties were centered in the north before the Mongol invasion. Mongolia was the base for Genghis Khan and his vast Mongol Empire. Activity was centered on the Onon River that flows east into the Heilongjiang in the northeast of Mongolia. His grandson Kublai Khan overran the whole of China to form the Mongol dynasty. After the dynasty and the empire fell, Mongolia came back under Chinese rule under the Qing dynasty when both Inner and Outer Mongolia were part of China. 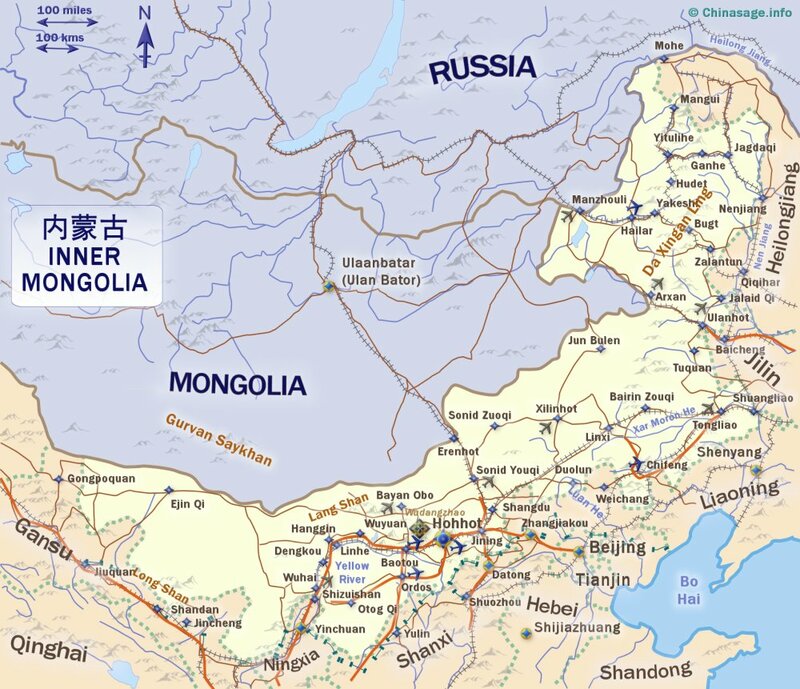 Towards the end the Qing dynasty, Russia expanded south and east creating friction over control of Mongolia. In 1924 the Russian Red Army established the Mongolian People's Republic in present day Outer Mongolia and it has remained under strong Russian influence ever since. Inner Mongolia was a battleground between Russian; Japanese; Chinese and Mongol forces from the decline of the Qing until the formation of the People's Republic. New railways linked it with northern China and many Han Chinese settled in the southern belt. Inner Mongolia has long cold and dry winters with short, very hot summers. 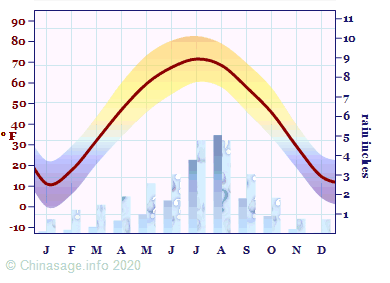 It is particularly arid in the western half. There is a good proportion of ethnic Mongolians and other nationalities (20%), in fact here there are more ethnic Mongols in the province than in the whole of the neighboring nation of Mongolia. Industry and agriculture are fairly limited, particularly in the harsher desert regions. Extensive efforts have been made to build a shelter belt of forests to protect the neighboring provinces from the influx of sand from the Gobi desert. The husbandry of grazing animals produces leather, lamb and cashmere. The forests in the far north east provide considerable softwood timber. It remains excellent pasture land and ancient herding traditions are still practiced. Citation information for this page : Chinasage, 'Inner Mongolia Autonomous Region China', last updated 4 Dec 2018, Web, http://www.chinasage.info/maps/neimongol.htm.